"Believe me, you don't want Hannibal Lecter inside your head." BFI has debuted a trailer for their restored re-release of the serial killer thriller classic The Silence of the Lambs. First released in early 1991, the movie went on to win Best Picture at the Oscars, as well as Best Actor, Best Actress, Best Director and Best Screenplay. The BFI is re-releasing it as part of their "thriller season" this fall, and will play it in cinemas around the UK. No word on a US re-release, but it doesn't seem like anything is in the works. 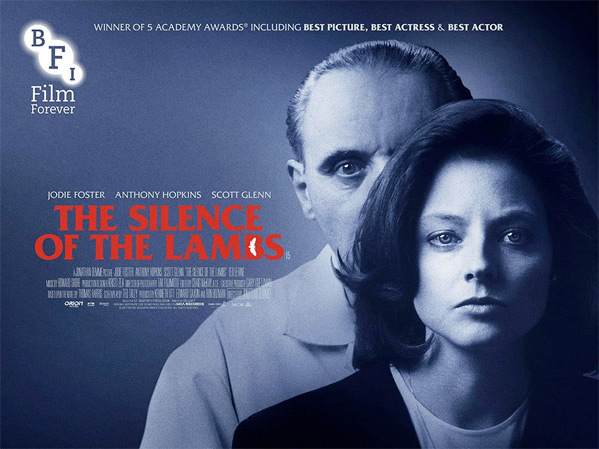 The Silence of the Lambs stars Jodie Foster as a young FBI agent who tries to work with the iconic serial killer Hannibal Lecter, played by Anthony Hopkins, to hunt and find a murderer named Buffalo Bill. The cast includes Scott Glenn, Anthony Heald, Kasi Lemmons, and Frankie Faison. This film was such a huge success it inspired 3 sequels, not to mention a fascination with serial killers. Definitely worth seeing in the cinema. FBI agent Clarice Starling (Jodie Foster), a specialist in serial killers, is fresh out of training and on the hunt for psychopathic murderer Buffalo Bill before his female body count rises. She adopts a high-risk strategy in visiting the imprisoned, dangerous and highly intelligent psychiatrist Dr Hannibal Lecter (Anthony Hopkins) for his insight, but Lecter wants something in return from her that goes far beyond the acceptable. In Lecter and Starling author Thomas Harris created an unforgettable duo, and Hopkins and Foster perfectly capture this disturbing relationship on screen. Showered with awards upon its release, this is one of the great thrillers of the last 30 years, and remains as vital and horrific today. The Silence of the Lambs was directed by Jonathan Demme (of only Married to the Mob, Swing Shift, Stop Making Sense, Something Wild at the time), and was first released in February of 1991. The BFI will re-release the film in theaters in the UK starting November 3rd this fall. Theater listings here. Who wants to go see this?